The set for Florent Schmitt’s ballet Oriane et le Prince d’Amour, composed in 1932/33 and staged in 1938. 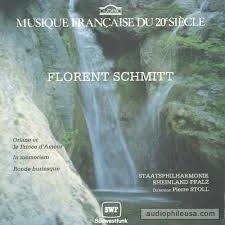 One of the most memorable aspects of French composer Florent Schmitt’s musical output is his artistic work in the “orientalist” realm. In fact, in this aspect it could be claimed with some justification that Schmitt had no peer, notwithstanding the efforts of other fine composers in France (Saint-Saens, Bizet, Lalo, d’Indy, Roussel, Rabaud, Ravel, Delage, Aubert, etc.) and elsewhere – particularly the Russians. In a string of compositions that began with the Psalm 47 in 1904 and continued through many other impressive musical scores like La Tragédie de Salomé, Antoine et Cléopâtre and Salammbô along with numerous smaller tableaux like Danse des Devadasis and Danse d’Abisag, Schmitt was the major orientalist composer of his time. His last foray in this realm also happens to be one of the least known: Oriane et le Prince d’Amour, Op. 83 (Oriane and the Prince of Love), a full-length ballet that Schmitt composed in 1932/33 for the famed Russian prima ballerina Ida Rubinstein. Russian prima ballerina — and creator of the “Oriane” role — Ida Rubinstein (1885-1960). Mlle. Rubinstein was one of the dancers who had made Schmitt’s Salomé ballet a staple on the Parisian stage, having starred in the 1919 production at the Paris Opéra. She then teamed up with Schmitt the following year in a lavish production of André Gide’s adaptation of Shakespeare’s play Antony & Cleopatra, for which Schmitt composed the incidental music performed between the acts. So it was only natural that in seeking another suitably exotic subject for a ballet in which she would be the femme fatale star, Rubinstein would look to Florent Schmitt again. The manner in which the composer came to learn of the commission is amusingly recounted in Vicki Woolf’s biography of Ida Rubinstein, Dancing in the Vortex. In it, the author quotes Florent Schmitt in his own words. And what a ballet it was: A nearly hour-long production in two acts and four scenes originally to be called Oriane la sans-egale (Oriane the Incomparable – perhaps an indication of the high regard in which Mme. Rubinstein held herself), the story line went several steps beyond the “passion and blood” of even Salomé, Cléopâtre and Salammbô. Based on a dramatic poem by Claude Séran, an overview of the ballet’s action suggests a tale similar to Mikhail Lermontov’s poem about Tamara, the bloodthirsty Circassian queen who availed herself of lovers nightly — only to dispatch them into the Daryal’s river gorge by the next morning – and which the Russian composer Mili Balakirev portrayed so effectively in his tone poem of 1882. But I also see similarities to several of the ballets and operas of Alexander von Zemlinsky and Franz Schreker, two Viennese composers who were famously attracted to plot lines that were laced with psycho-sexual overtones. 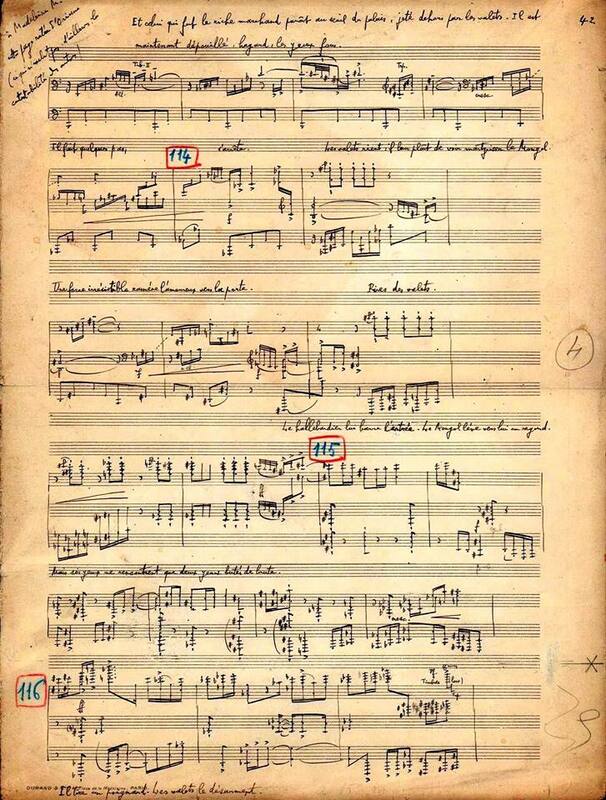 A page from Florent Schmitt’s original manuscript for the ballet Oriane et le Prince d’Amour, showing the composer’s characteristically meticulous penmanship. Oriane is a noblewoman whose desire for carnal liaisons is insatiable: now a poet, next a rich Mongolian merchant, then others. But she soon tires of these lovers, always seeking the thrill of the next conquest – and always attended to by a dwarf, her ever-loyal though completely ignored companion. Oriane’s next target comes in the form of a handsome, mysterious knight-prince from the east. Once again, the “call of love” sounds in Oriane’s heart. But unlike her other liaisons, this man is different. Learning of her licentious lifestyle and unspeakable excesses, the prince rejects Oriane’s attentions and departs the palace. And now comes the final denouement: Seeking to blot out this rejection, Oriane organizes a wild evening of revelry – replete with levels of debauchery heretofore unknown at the palace. As an angry mob descends on the castle, roused to action by the vile transgressions taking place therein, Oriane dances with her final partner – death. In the end, it is left to Oriane’s ever-faithful dwarf to be the lone soul to mourn the princess’ demise. Clearly, the Oriane story line gave Florent Schmitt rich material with which to create a musical fresco of powerful drama, musical color and effects … and he does not disappoint! Schmitt began with a full orchestra to which he added extra woodwinds, expanded percussion and keyboard instruments, along with a mixed chorus and tenor solo, in the process of creating a ballet score that lasts nearly an hour. The instrumentation for Florent Schmitt’s ballet “Oriane et le Prince d’amour” is lavish — and the score also calls for a mixed chorus with solo tenor voice. The premiere stage performance of Oriane et le Prince d’Amour wouldn’t happen until five years after its composition – on January 7, 1938 in a Paris Opéra production that also featured Serge Lifar as choreographer and ballet-master. 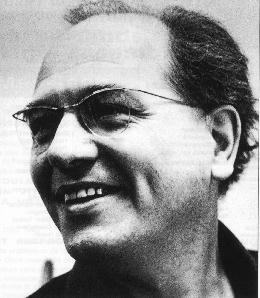 The famed flautist and composer-conductor Philippe Gaubert directed the production. But a concert suite Schmitt prepared from the ballet had already been premiered the year before — in a February 12, 1937 Paris performance conducted by Charles Munch. “On 12 February, the first performance of Oriane et le prince d’amour, the unparalleled ballet with choruses by Florent Schmitt, was given in a concert version with the Société Philharmonique Orchestra under the direction of the vigorous and passionate Charles Münch. This is a sumptuous work: gleamingly, powerfully, at times overwhelmingly orchestrated. Languid melodies with voluptuously oriental contours; a dance of the Mongols in 5/4 where the harsh root-position minor chords slide modally over dissonant basses; a whispering dance of love for four horns, couched in warm pedals; a sniggering, swarming dance of the mad, with devilish rhythms. While Oriane appears to have been a success in the concert hall in France — with performances of the complete ballet happening in 1946 (Jean Martinon/Paris Conservatoire Orchestra) and 1956 (Pierre Dervaux/ORTF) and of the suite in 1947 (Eugène Bigot/Lamoureux Orchestra), 1955 (Robert Blot/Paris Conservatoire Orchestra) and 1957 (Martinon/ORTF) — only the suite has received a commercial recording. And it emanated from outside France — made in 1987 by Southwest German Radio featuring the Rhineland-Palatinate Philharmonic Orchestra under the direction of Pierre Stoll and released on the Cybelia label. While the orchestra and the performance are not first-rank, the Cybelia recording gives ample proof of the power and effectiveness of Schmitt’s score. The distant fanfares that open the suite are some of the most ominous I’ve ever heard in any piece of classical music. They proclaim — in no uncertain terms — that this is going to be no ordinary musical experience! What follows is an achingly beautiful “dance of love” … and then a ferocious “Dance of the Mongols,” portraying at once the voluptuous color and barbaric savagery of the rich Mongolian merchant’s retinue. 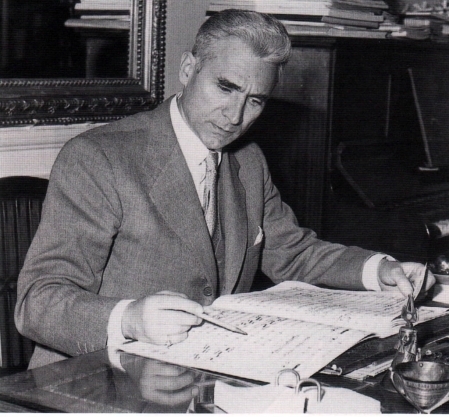 To my ears, another interpretation — the 1957 public performance by the great Jean Martinon leading the ORTF Orchestra — is significantly better interpretively but suffers from less-than-ideal sonics and the usual audience noise. Still, it is well-worth hearing as well. 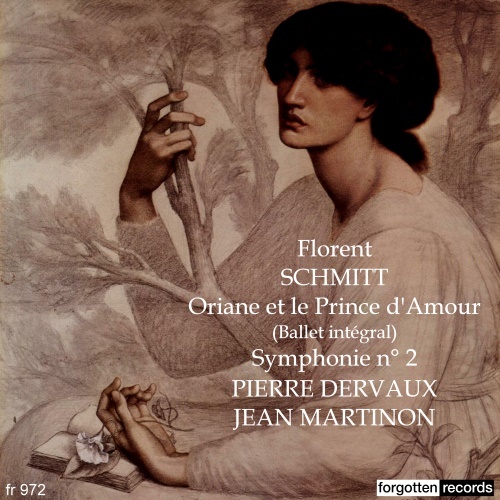 The dearth of recordings of Oriane et le Prince d’Amour represents a huge gap in the discography of Florent Schmitt. The 1987 Cybelia CD documentation of the suite is long out of print — and that performance suffers from less-than-polished ensemble in any case. Thanks to Philippe Louis and his marvelous music channel, the Cybelia recording has finally been uploaded to YouTube, providing at least some reference documentation for those who wish to investigate the music. To my mind, several of Schmitt’s most ardent advocates in the conducting world today could do great things with the Oriane score: Stéphane Denève, JoAnn Falletta, Fabien Gabel, Jacques Mercier, Jean-Luc Tingaud and Yan-Pascal Tortelier. Clearly, a work such as this would be “right in their wheelhouse.” Here’s hoping one of them will take up the cause of Oriane before long. Pierre Dervaux’s 1956 live performance of Florent Schmitt’s Oriane has been issued on the Forgotten Records label (June 2014). Update (6/25/14): As of June 2014, a recording of the complete ballet score has finally been released. It’s the 1956 concert performance featuring the O.R.T.F. Orchestra and Chorus directed by Pierre Dervaux — a conductor who was an evangelist for Schmitt’s music throughout his career. The complete recording fills in the blanks left by the suite, to include the poet’s serenade of Oriane (performed by a tenor solo accompanied by the chorus), some dramatic transitions between scenes, and the biting and bizarre Fête des fous “Feast of Fools” that concludes the ballet. The CD is available from Forgotten Records. 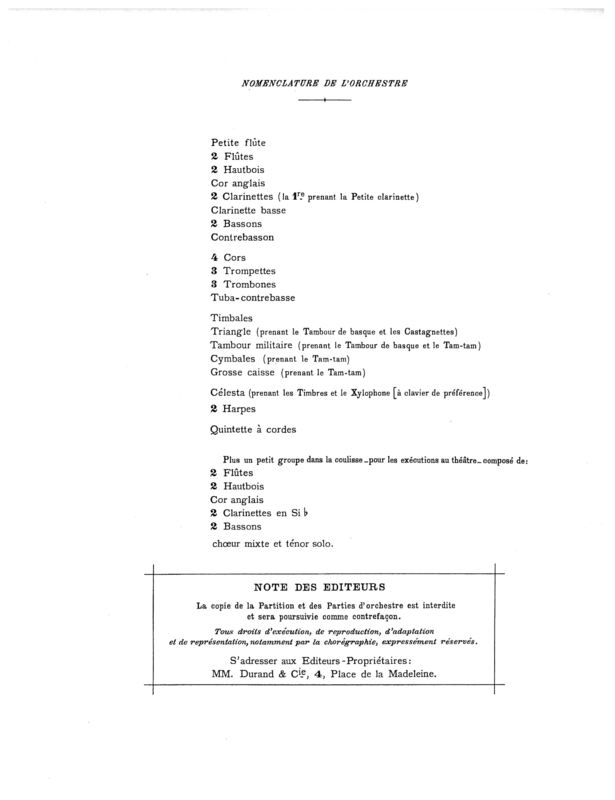 This entry was posted in Ballet, Classical Music, Composers, French Composers, Uncategorized and tagged Alfred Bachelet, Arthur Honegger, Ballet, Charles Munch, Classical Music, Dancing in the Vortex, Florent Schmitt, Forgotten Records, French Composers, Ida Rubinstein, Jean Martinon, Louis Aubert, Music, Nones, Olivier Messiaen, Oriane, Oriane et le Prince d'amour, Paris Opera, Philippe Gaubert, Pierre Dervaux, Schmitt, Serge Lifar, Vicki Woolf. Bookmark the permalink.